Recorded event: May 18, 2011 Time: Now Available! 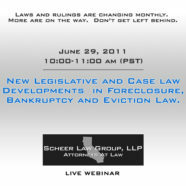 Recorded event: June 29, 2011 Time: Now Available! Recorded event: September 20th, 2012 Now Available! Pricing options: $59.00* for all prior attendees who registered and paid for the webinar. $125.00** for all others. Recorded event: December 10th 2013. Now Available! Changes to TILA/RESPA Mortgage Service Rules: Periodic Statements in Bankruptcy. Recorded event: April 18, 2018 Now Available! Pricing options: $49.00* for all prior attendees who registered and paid for the webinar. $199.00** for all others.